"A wonderful, delicious cookie that makes everyone's mouth water." Sift together the flour, baking soda, cream of tartar and salt, set aside. In a medium bowl, cream together the butter and sugar. Stir in the eggs, milk, vanilla and almond extracts. Gradually stir in the dry ingredients until fully incorporated. Cover bowl and chill for 1 to 2 hours. In a shallow bowl or saucer, stir together the remaining brown sugar, white sugar and cinnamon. Roll the chilled dough into 1 inch balls, then roll the balls in the sugar mixture. Place cookies 2 inches apart on the prepared cookie sheets. Bake for about 8 minutes in the preheated oven, until cookies begin to brown at the edges. Remove from baking sheets to cool on wire racks. The quintessential snickerdoodle all spiced up! I didn't like these cookies at all.The almond extract was very overpowering.Mrs. 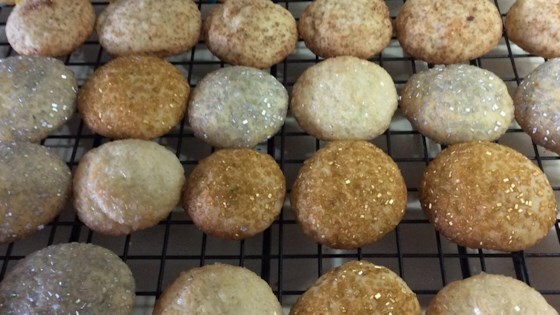 Sigg's Snickerdoodle recipe from this site has a much better flavor and looks picture perfect! This is by far the best snickerdoodle recipe I have ever tasted!! I will continue to make this recipe over and over. One hint, flatten the cookie dough out a bit before putting in the oven.